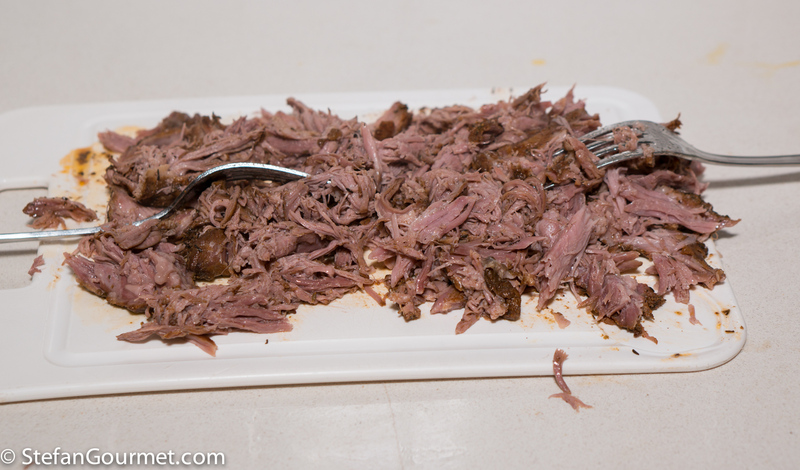 Pulled pork is fantastic when prepared sous-vide. It is not only delicious, but also so easy and foolproof. But what to do when you guests coming over that do not eat pork? Make pulled lamb instead! 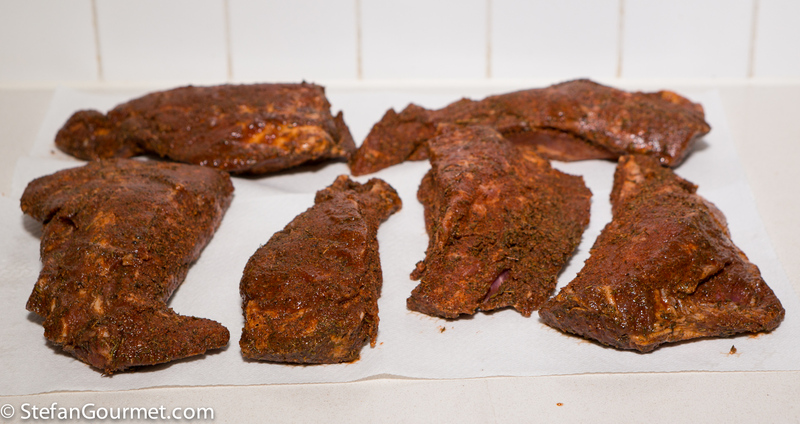 The procedure is very similar, I only changed the spice rub so it would be more suitable for lamb, and I refrained from using a tomato-based barbecue sauce to allow the lamb flavor to shine. You won’t need a sauce, but you should definitely mix the juices from the bag with the meat. The best cut of lamb to use for this is what is called the “neck” around here, which is actually not just the neck (which is quite small) but also the meat right behind it. One lamb yields about 1 kilo (2.2 lbs) of this cut. It is so suitable because it has a lot of connective tissue and intramuscular fat, which will mean flavor and succulence in the final result. I made this for a crowd, so the photos are for a triple batch. 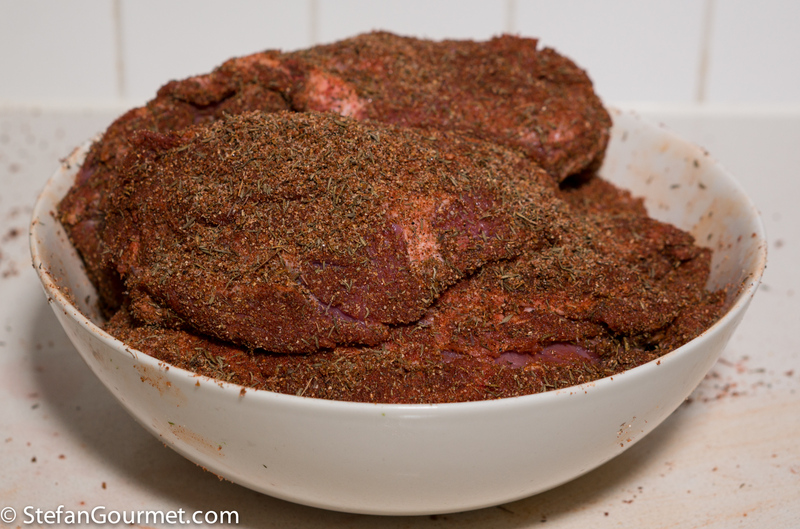 Combine all the ingredients for the spice rub in a small bowl and stir to mix. 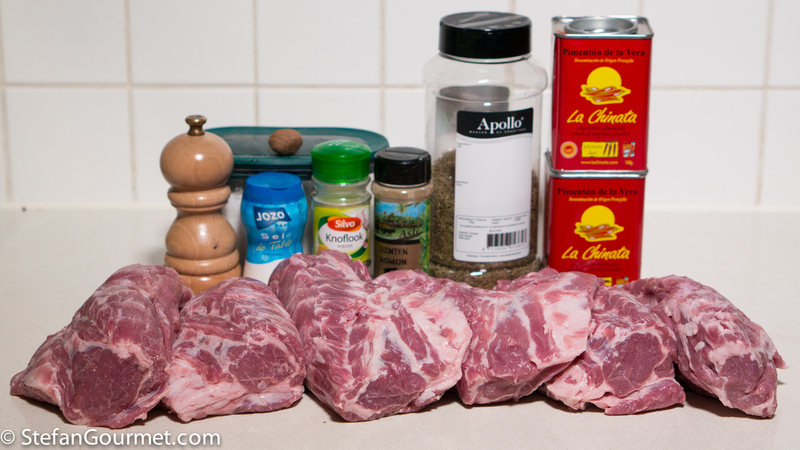 Cover the lamb with this mixture on all sides. 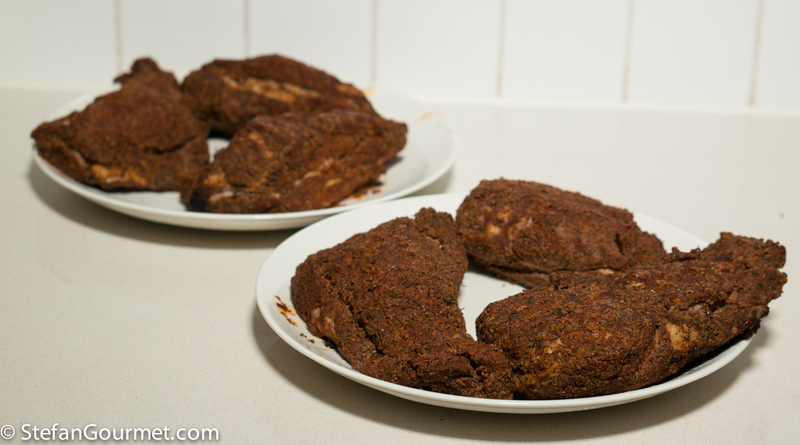 Now allow the spice rub to do its magic. 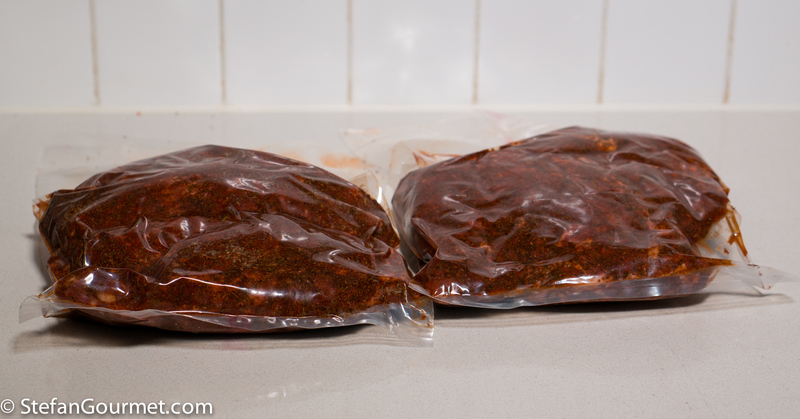 It helps to vacuum seal the meat, but you could also just cover it with plastic wrap and let it sit. At least for a couple of hours, but preferably overnight. After this short cure, pat the meat dry with paper towels. 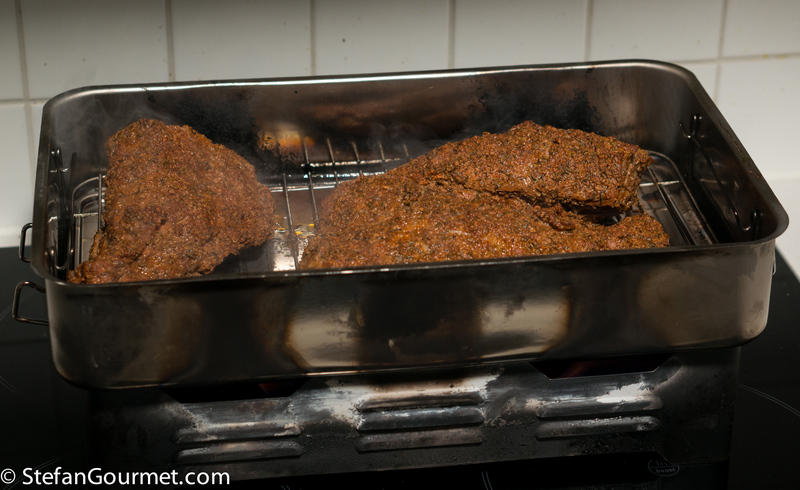 Smoke it in a tabletop / stovetop smoker with 2 tablespoons of smoking dust. Put it over the burners with the hole in the lid open until the first smoke appears. Then close the lid and start the timer for 15 minutes. After this the lamb will be smoked on the outside but not cooked all the way through. 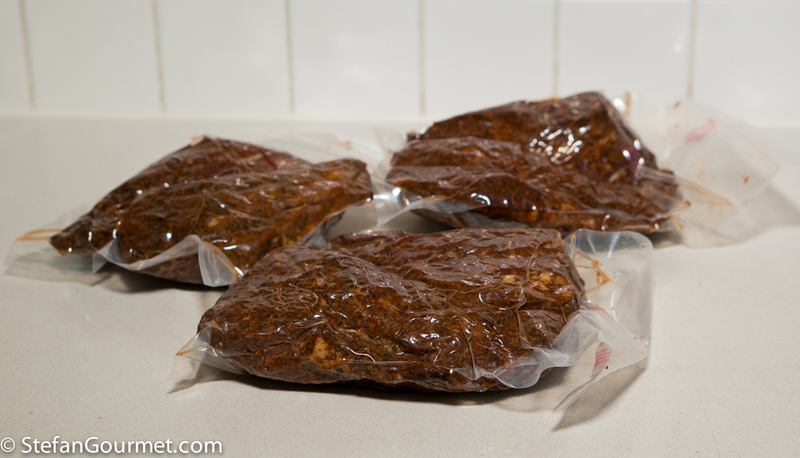 Allow the lamb to cool before vacuum sealing. 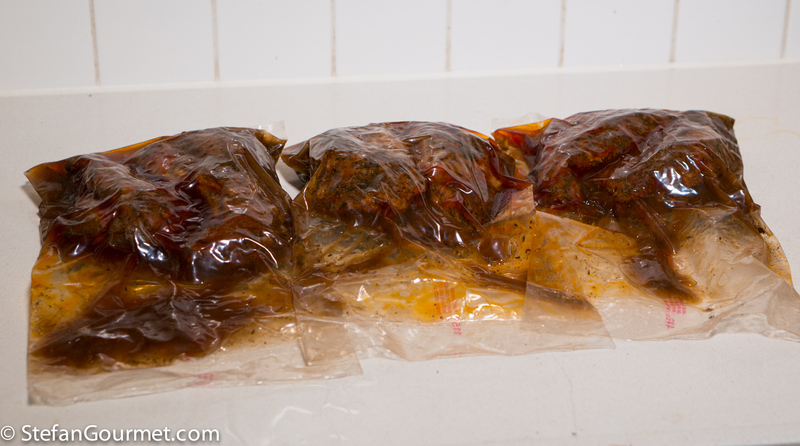 Vacuum seal the lamb once it has cooled. Cook sous-vide for 24 hours at 74C/165F. 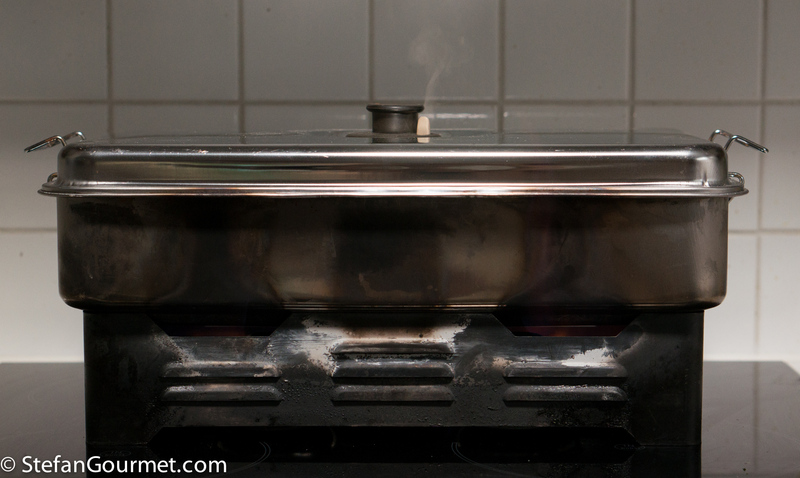 Do not cook together with something else, because smoke will permeate through the bag into the water and could also permeate into other bags and cause a bitter flavor. You will notice the water will become brown and smoky, so discard it after the cook. 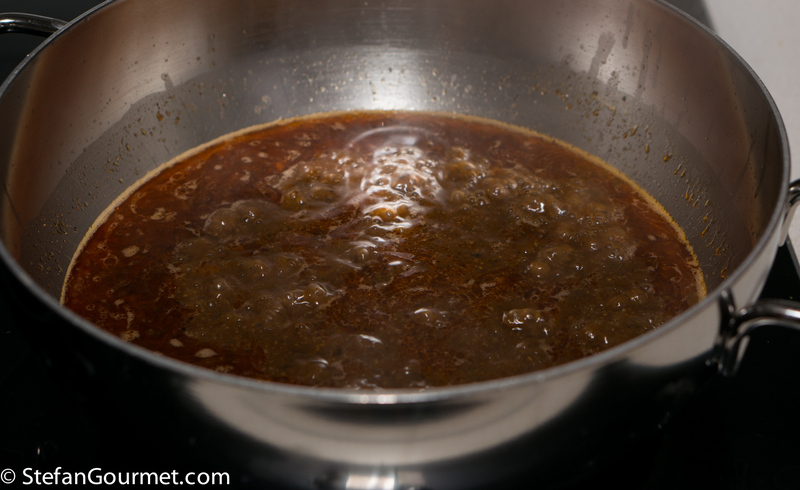 Strain the juices into a casserole or Dutch oven and bring to a boil. When they boil, turn off the heat. Meanwhile, pull the lamb with two forks. 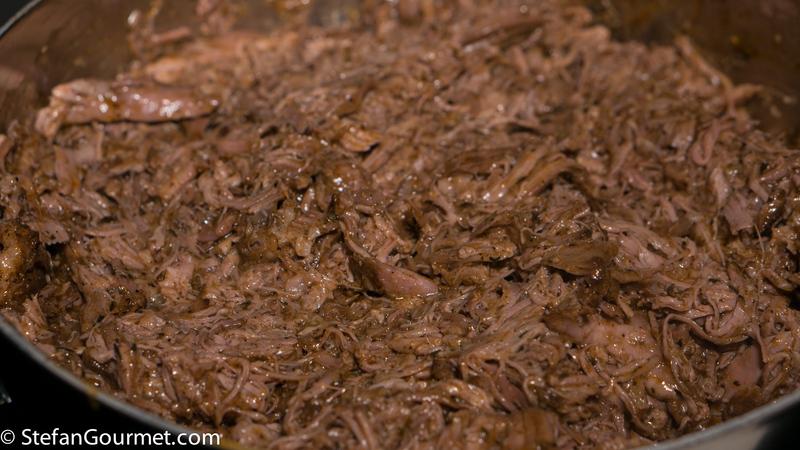 Add the pulled lamb to the juices. 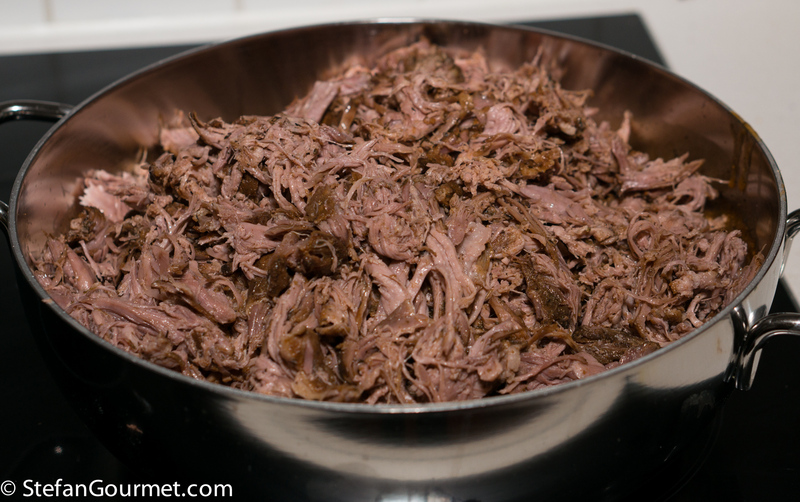 Stir to mix, and the pulled lamb is done! 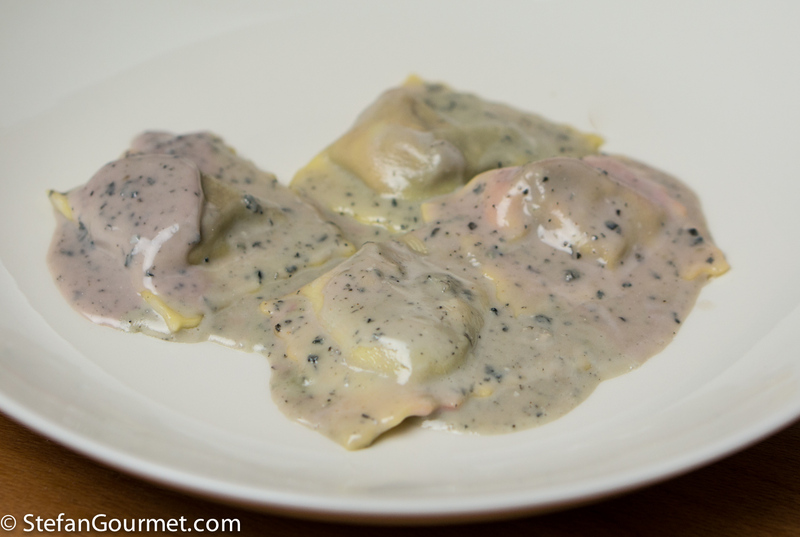 These beetroot ravioli with gorgonzola sauce have a surprise, because the beetroot is liquid inside. So when you bite into the ravioli, beetroot juice will flow in your mouth. The contrast between the creamy salty pungent gorgonzola sauce and the earthy sweet fresh beetroot that bursts into your mouth is very nice. Oops’a’daisy – ‘our’ neck gets cut in the ‘opposite’ way! 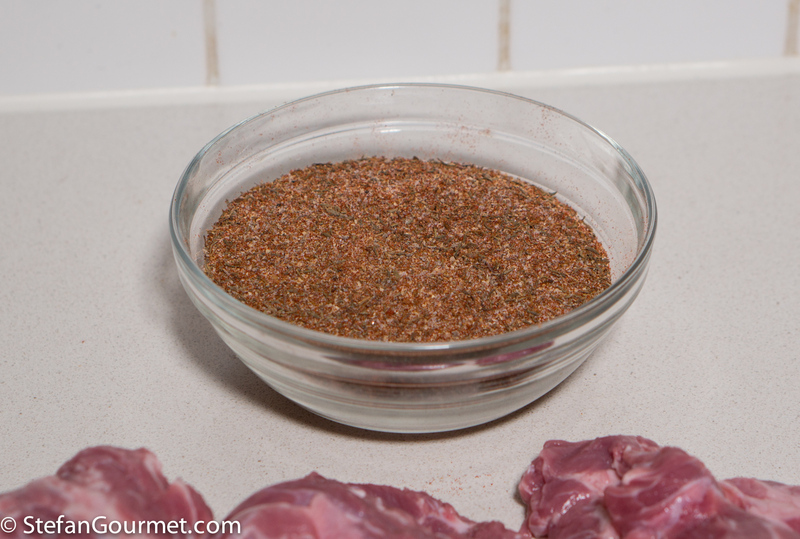 Cumin, garlic, nutmeg, paprika . . . . yes – ‘my way’ – will try: ‘yes’ – am boring, ‘yes’ . . . . This is the neck plus meat behind it (above the shoulder) with the spine removed so you end up with two halves. Does your necks come with the bone still in or without the ‘above the shoulder’ part? Pedestrian and plebeian: we normally buy as about 2 cm thick ‘neck chops’ or, far more rarely, as shoulder chops, again bone in. Have just looked up an Au lady who ‘knows’: whole necks are meant to be able to be bought: I have yet to see any . . . . my bad 🙂 !! Those ‘neck chops’ sound like a lazy butcher to me, as they don’t need to debone the neck (which takes my butcher only a minute). That must have been a big crowd! It looks very delicious. Stefan it looks yummy. Could you provide more information about your table top smoker? It sounds like this piece of equipment is key to success. I’ve been wondering about getting a slow cooker where one can specify the temperature down to 150F 65C . Would a long braise at this temp work as a sous vide alternative? The table top smoker is very simple. It comes with small burners, but you could also use it on a gas stove. It is only suitable for warm/hot smoking, as it gets quite hot inside (like 180C/350F). It is perfect for hot smoked salmon, mackerel, trout, chicken breast, or duck breast, or to pre-smoke meat such as ham hock, brisket or leg of lamb before cooking sous-vide. They cost less than 50 euros/50 dollars. A long braise would work as a sous-vide alternative, just not as good because there is less temperature control and the food isn’t sealed. You would need a setting of 74C/165F to get a “pulled” result. Roasted Potato Experiment #1: Salting Before or After?